The global economy of the 21st century has evolved into a complex system of organizations resulting in a myriad of changes in the world of work. The diversity in values, ideologies, and perspectives oftentimes leads to misunderstanding and conflict, which must be addressed in order to facilitate a stable work environment. 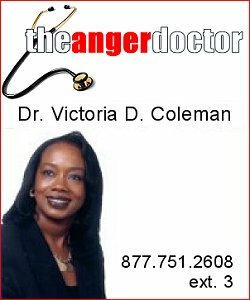 Dr. Victoria D. Coleman, The Anger Doctor, is qualified to assist a variety of organizations and institutions in resolving conflict in the workplace. The Anger Doctor offers comprehensive Conflict Resolution and Management Services for business, industry, education, government, professional associations, and community organizations. Consultants with expertise in anger management and conflict resolution, specifically, human behavior, communication skills, mediation, and research will provide the following Conflict Resolution and Management Services. Dr. Victoria D. Coleman will custom design a Conflict Resolution and Management Program to meet the issues, needs, and concerns of your organization or institution. For additional information on Conflict Resolution and Management Services, contact Dr. Coleman at 312-268-0011 (business); 702-220-5300 (business); 310-591-8249 (business); 877-751-2608, X3 (toll free); 708-405-4105 (facsimile); or info@angerdr.com.